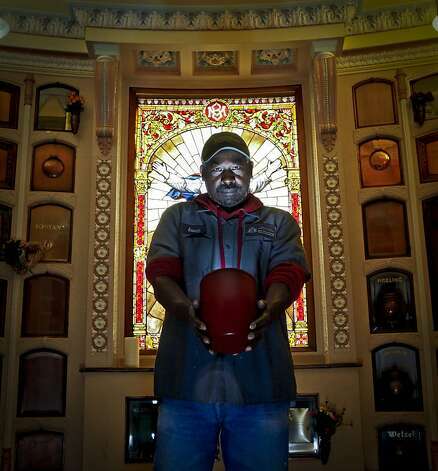 In his 24 years as caretaker and historian at the Neptune Society Columbarium, Emmitt Watson has seen them come and never go from the big round vault that backs up to Geary Boulevard in San Francisco. Inspecting the grounds in his gardening clothes, Watson, 55, speaks in cadences, as if he's about to change into a dark suit and deliver a sermon. A: The Columbarium is a place of inurnment, but I call it a place that you can bring life and add to the death. Q:In what form do the remains arrive? A: They've already been cremated and they come in a plastic bag inside a box. The remains go into whatever urn the family purchases. It could be a martini shaker. You can make it into anything you want as long as it is not disrespectful to the building. For me it would be a paint bucket. I'm a painter. Q:Where do they go from there? A: Into niches in the wall, but I don't like that word, niche. I call the small ones apartments and the big ones condos. Anything bigger than that is a village. A niche is basically an open hole with glass or copper on the front. People like to have glass so they can show off their personality when people are walking around taking tours. Q:How did you come to work here? 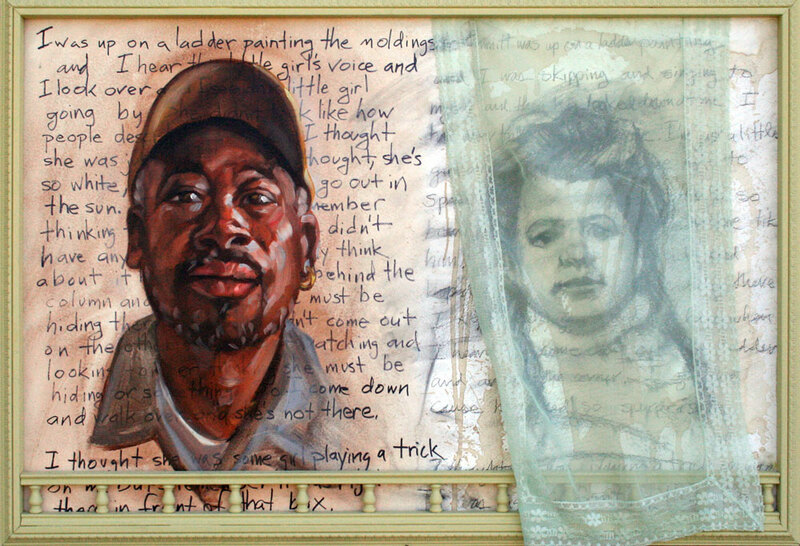 A: I came to paint the outside with four other people, not even knowing what this was until one day the owner walked up and asked would I consider working for him. Q:What are your duties as historian? A: Telling stories. I set up the services, do parking duty, maintenance and gardening. People think there is a whole crew working here. I'm the crew. I'm also the tour guide. Q:What kind of tour guide? A: What I do is try to keep the people's memory alive for the relatives. When I do an interment, I ask them, "Can I keep your mother's memory alive for you?" You ought to see the expressions on their faces, because that is a question no one has ever asked. Q:How do they answer it? A: They just get to talking and not stopping. Q:What is the history of the Columbarium? A: Eighteen ninety-eight is when it opened to the public. There used to be cemeteries as far as you can see. Divisadero was the borderline. This was not in city limits. It was all sand dunes. Q:Who are some of your favorite friends here? A: They all are my friends, but if you want me to be picky about them, my favorite is Miss Lily Moy, because she was a baseball fan and she's in a big baseball. A: There are only about 50 niches left, so we're adding a room. About the middle of summer it will be finished. It will have at least 500 niches. Q:Is it fun working here? A: Yes and no. The "yes" part is because I get to make a sad heart smile. The "no" part is the pain I have to see every day. A: I was born in Hammond, La. I left when I was 13 years old. Palo Alto was the first stop. We moved up to San Francisco and I went to George Washington (High School). A: I never thought about it, but I sure didn't want to be working around the dead. A: On the corner, one block away from here. I live in an in-law apartment. The neighbors call me the Mayor of Loraine Court. A: This is my neighborhood hangout right here, the Columbarium. A: Anywhere there is a casino, brother. A: Me. I'm the only one who can play me. I act every day. I'm acting right now talking with you. I used to work as the building maintenance guy part time at a place reputed to have ghost activity - my wife works there now in an office job. Anyway, during WWII the Nazis occupied the buildings and in the Peisestue (main fireplace room) one of them shot two holes through the ceiling after tiring at what sounded like someone running around - the bullet holes are intact to this day. "It is a bed & breakfast during summer. The ghosts at Hald plays the piano, and monk like apparisions have been seen walking the first floor."